The latest episode of the Classic Comics Forum Podcast is now available, as tolworthy and I discuss Fantastic Four #1! I've been waiting for this one more than any other podcast episode thus far! Can't wait 'til I have a free hour to sit back and listen. Very good discussion. tolworthy, did you ever seek input or hear from Kirby/Marvel experts like Mark Evanier or Michael Vassallo? Thanks for letting me drone on! Sorry if I got a bit incoherent by the end: I live in Scotland, and the interview took place in the wee small hours. I am usually tucked up on bed with my teddy bear and Marvel Monsterbus long before that. Crimebuster was a perfect host, and did all his homework ready for a battle royale, but I'm afraid that, like a coward, I sort of waved the white flag at the start. I'm not much of an arguer! When I get interested in a topic I tend to examine it in obsessive detail (that's why I felt I should write a book-length post), but then I get burnt out. Exhausted. I just have to get it out of my system, then it's almost forgotten because I'm onto something else. So I apologise if I don't reply much to this thread. I am grateful that anybody listens to the podcast or reads the book, but I really don't have much useful to add! did you ever seek input or hear from Kirby/Marvel experts like Mark Evanier or Michael Vassallo? Yes, Michael is a regular on the "Jack Kirby Dialogue" and "Marvel Method" Facebook groups. He was invaluable in correcting some of my bigger errors regarding what happened in the 1950s. I am in awe of the amount of work Vassallo has done! 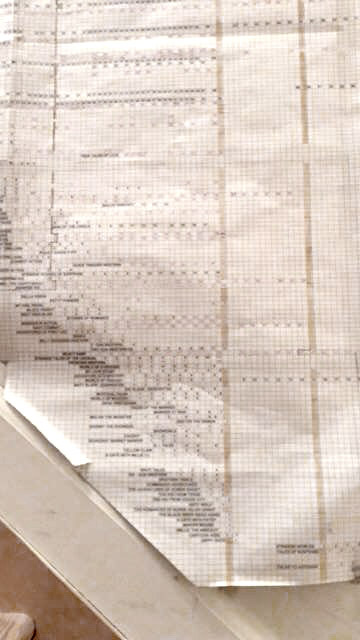 To give just a taste, this is a photo he sent me of just part of one of the charts he made, showing every Goodman book ever published. The chart focuses on the crash of 1957: count how many titles suddenly stopped, with the rest becoming bimonthly. The chart is so big that it extends up his stairs! Evanier also follows those Facebook forums, and occasionally replies when people need him to answer a specific question. But Evanier didn't start working for Kirby until 1969. I was most interested in what Kirby was doing in early 1961 and before, so I relied more on Vasallo. Evanier and Vasallo also have a difference in focus. Evanier is an expert on what Kirby said later, but of course memories can change, and memories only focus on the parts that seems important in a particular time. 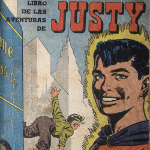 In contrast, Vasallo studied the primary documents, published at the time. So for example, the fact that Kirby said "I wrote it" is interesting, but being able to see what Kirby was actually producing before and after was much more interesting to me. But both of these approaches (memories and documents) are still historical in nature. My own interest is different again: I care if the story is interesting to me. Personally, I soon lose interest in who did what. What matters to me is that, for my personal tastes, Kirby's name on a comic, in any capacity, is the best guarantee I know that a story will be enjoyable to me, now, at age 49. At the end of the day I am just a kid looking for the kind of comics I like. And personally I love everything Kirby touched! Listened this morning while running audit reports at work. Mr. Tolworthy: love your voice and accent and could listen to your FF conversations for hours on end. I too love ALL things Fantastic Four. Very fun and interesting discussion with you and your love of Kirby shines through in your enthusiasm. My 1st FF issues was a 2 for 1 purchase from the shelf of the local Korean market in late 1971 after my return to school and having pocket spending money. I got FF 102 with Romita doing his riff on Kirby and the reprint of FF 36 in Marvel Greatest Comics 28 still sitting dusty on the shelf over a year after they were 1st published in 1970. Fantastic Four versus Frightful Four sealed the deal and my love of the team. From such a humble start was my FF collecting begun. While the Lee dialogue was atypical Stan it was the amazing Kirby artwork that captured my mind and imagination. Only in later years was I to learn that what I was reading was more of an 80/20 deal where Kirby was the idea man/artist/creator with his visualizations dialed up to 11 as Spinal Tap says with Lee working overtime in dialogue/story over what Kirby provided. It was easily seen once I found this out that Kirby was doing the boatload of the work with Lee fine tuning Kirby to what would be considered "MARVEL". I consider Kirby/Ditko as the bricks which Marvel was built upon and Lee as the cement mix filling and binding/holding it all together. Really enjoyable podcast. Well done, tolworthy and Crimebuster. Tolworthy has a scholar’s voice, and the scholar’s knowledge to go with it! Fascinating analysis that nicely complements “The case for Kirby”. I know, right?? He sounded so professorial (this is meant as a compliment). Thanks so much for this guys. I've listened to all the podcasts so far and found this one to be just as interesting as all the others, even though I felt more familiar with this material than most of the rest. Great to hear your call out tolworthy, for the 1972 Uk Marvel Annual. Don't think it was my first exposure to Marvel (was Mighty World Of Marvel a little earlier?) but its the one that sticks there in my memory as the beginning of a life long interest. I'm sure I read and reread that book until it fell apart! (I recently tracked down a tatty copy on ebay - just to wallow in nostalgia for a little while). This episode recently became the first to pass 200 downloads! Hurray!